Whilst history was made in 2000 with the extension of the light rail system to Lilyfield, the suburbs of Glebe and Lilyfield were once served by an extensive government-owned tramway infrastructure. Sydney’s original goods station was opened in 1855. It was located just east of the passenger terminal near Redfern and handled all goods traffic in and out of Sydney (except for local firewood which was unloaded at Newtown). The goods station at Darling Harbour (DH) opened soon afterwards and was once one of the largest depots in the world, occupying almost 65 acres. When the branch line to DH was built, it only ran to the toll bridge at Pyrmont. The line passed through the oldest railway tunnel in NSW (running below Railway Square and the current UTS/’Marcus Clark’ building). Services on the line to DH were limited by the shallow depth of the harbour (restricting the size of ships), shortage of wharves and the expensive toll on the privately owned Prymont Bridge which provided access to the CBD. Pyrmont Bridge was purchased by the government in 1884 and the toll was removed. The DH yard was then further expanded towards Union Street. Increased demand on Redfern resulted in DH being expanded in 1875 from six people handling 35,19 tons to volumes exceeding 152,543 tons in 1879. In 1890, extensions across Union Street were erected to service the newly build coal wharves. By 1915 it was obvious that movement of goods trains in and out of DH via the suburban lines was interfering with the passenger timetables. Numerous freight-only lines around Sydney were constructed in 1919 (including a double track from Canterbury below Lewisham viaduct through Leichhardt, Rozelle, Glebe and Pyrmont to Darling Harbour). A tram departs the Rozelle Depot (adjacent to Harold Park) bound for Sydney University and the city. It is over the section of this historic rail line (between Bridge Road, Glebe and Catherine Street, Lilyfield) that The Society’s members and friends travelled in an inaugural trip using a Light Rail Vehicle (LRV) in July 2000, stopping at Glebe, Jubilee Park, Rozelle Bay and Lilyfield. Darling Harbour continued in use until 1984 when operations ceased to make way for the current tourist and trade exhibition development. In 1919 the NSW Government Railway built the first reinforced concrete railway bridge on its system over the northern end of Bellevue Street, Glebe. The experimental single span was restricted to 21ft in length and supported the goods line which was being built at the time from Rozelle to DH. Whilst The Society’s inaugural trip did not travel over this small but historic bridge, full public service crosses it continuously. 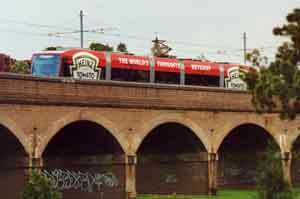 The viaducts were built across Wentworth Park and Jubilee Park in 1919 and have heritage significance today. In its heyday this line had up to forty train movements a day. It closed in January 1996, by which time it saw only weekly use to the Edwin Davey Flour Mill (adjacent to Metro Light Rail’s (MLR) present terminus at Wentworth Park Station). This double track tunnel is 500m long and runs from Pyrmont Bridge Road to Jubilee Park, passing below Glebe Point Road. The western portal is adjacent to the former Rozelle Tram Depot. Both portals now frame MLR’s Glebe and Jubilee Park Stations. 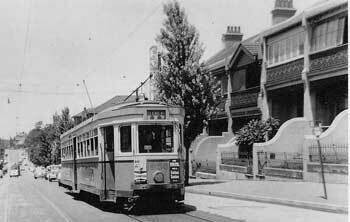 The tramway service along Glebe Point Road to the Point was opened in 1892 using steam tram motors and trailer cars. It was the first western suburbs line to be converted to electric operation in 1900 and it used power from the Ultimo Powerhouse. A six-minute service was provided on weekdays, increasing to four minutes during peak hours and on Saturday evenings. Trams ran every 15 minutes on Sunday mornings, and at six-minute intervals for the rest of the day. The city terminus of the Glebe Point service was Millers Point, located to the west of Circular Quay. Services continued until 23 November 1958, when buses replaced the then “unfashionable trams” as a method of public transport. Old tram lines still exist under the surface of Glebe Point Road. Between April 1909 and November 1958, electric trams provided services from the city to the original terminus at nearby Piper Street, Lilyfield. The track was progressively duplicated and extended to a crossover facility on the deck of the Bridge in 1925. The road level station and entrance constructed for the Metro Light Rail system stands adjacent to where once ‘light rail’ vehicles of a previous era performed safe working procedures.